By necessity, Penny and I have taken a bit of a break from blogging. There's the business blog, Hana's blog, the newsletter--and email replies. And those are just the things that we do in front of the computer. However, that's really no excuse for not doing a quick post every once in a while so that we can keep track of milestones. And here's a biggie. My mom turns 65 tomorrow, so we celebrated by going for Chinese dinner at the Flamingo restaurant on Cambie. We had a fantastic dinner that consisted of mostly seafood: jellyfish appy, prawns and scallops in a bird's nest, lobster in cream sauce, fish maw and crab soup, and steamed halibut. Other dishes included abalone mushrooms, poached chicken, longevity noodles, and tapioca pudding. Yummy! Our family is happiest when eating good food. The sad part is that we're Chinese, and as a family, we've NEVER gone for one of these delicious 10-course meals because none of us can read a Chinese menu. I had to call a friend, and she got her dad to order for us. 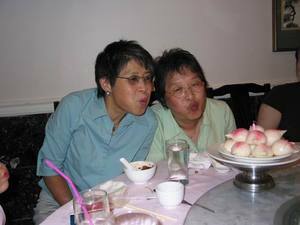 Here's my mom and my aunt (it was her birthday too) blowing out the candle in their longevity buns. And here's Ella in her "Chinese" party dress.